Cynanchum subvolubile Schumach. & Thonn. 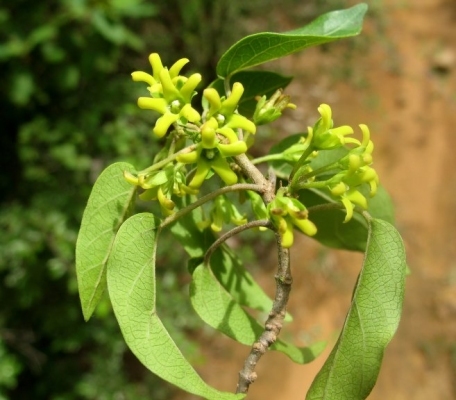 Marsdenia geminata (R. Br.) P.I. Forst. Periploca tenuifolia Willd. ex Schult. Plant scrambling over the ground at the Agri-Horticultural Society of India, Alipore in Kolkata. Gymnema sylvestre is a climbing plant, producing stems up to 3 metres long. The stems scramble over the ground, climbing into the surrounding vegetation. ]. The plant is widely used in India and is also commonly sold in other countries of the world, usually via the Internet. Africa - Mauritania to Ethiopia, south to S. Africa; through Arabia to India, Sri Lanka, China, Japan, Thailand, Vietnam, Malaysia, Indonesia.